"Andy, I am still helping the Orland library with Indiana history. 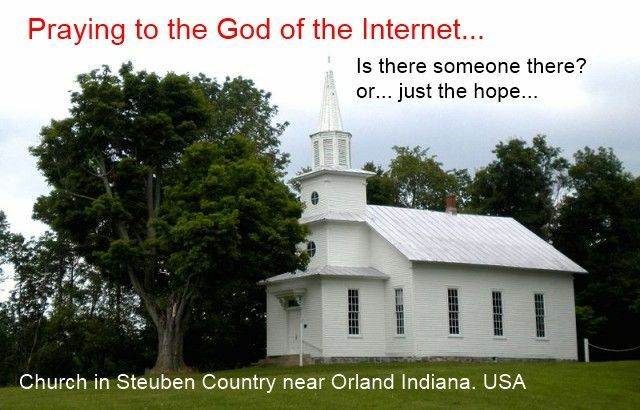 They want me to put on facebook a search asking if anyone has a book called Morley's History of Steuben County in 1955. Trine University, Tri State. has 1 copy and it is thought to be the last copy anyone knows about and we are wondering if some young person could have been given a copy by their grandparents. The pages are very delicate on the one at Trine and it is difficult to scan. Could you put it on face book for me, as I cannot seem to figure out how to do it? Thank you. Love Mom." Title: The 1955 history of Steuben County, Indiana. An historical, pictorial, complete county atlas and biographical county album. Author: Morley, Harvey Warren Chase, 1876-. Published: [Angola, Indiana] : H.W. Morley, editor and publisher, c1956. The internet is a tool, I can hardly stand to get on Facebook or Twitter, I only do so for business reasons, and somehow Facebook keeps finding my long-term friends from High School. However, like a class reunion, there is a reason why we do not stay in touch after all these years. Can a person use Facebook to announce a need? My Mother and Father have a terminal case of hope and faith, they believe in the good of humans, I think they need applauded, therefore I try my best to be a good son. I am sure after they die, I will remember every little question, I will remember every time I did not give them the time needed. I guess love is really equated to how hard I listen, even when I feel rather helpless. There is one copy in the world for sale! My value to be here is to work on the Internet, the DR has great Internet speed, so I explain a lot about working, and normal living. Dominican Republic is a country of Resorts, personally I believe a Resort in the USA could be 100 times better than here. If I wanted pampered, made to feel good, with great service, I need my own county citizens doing the service. The manners here in DR are horrible, the people of Haiti were respectful, fun and interested in something besides money. Here is all about Money. BUT, please realize, I have only been to Cabarete and Sosua, however the Expats who have lived all over the country say, Sosua as nice as it gets. I could explain I eat Pizza. Hamburger, and go to the store. If I do not talk with the locals, it is like a drab version of the USA, with a lot of things broken. I purchased Floor Wax yesterday, it cost me 5 USA dollars to try to make the floor of my shower pleasant looking. It was intriguing, they used and acronym, ISOC. I asked them to explain, however this is the generally mentality. It would be a great place to study why men buy women, you can live in a 300-400 apartment, with High Speed Internet and explain. I have been trying to give up explaining the ugly parts of culture, there is little beautiful, the people come here because, it is a sunny spot for shady people. The culture of Haiti is 50 times richer and full of life. I personally don't care if you are writing about Indiana or the Dominican Republic. As long as it is travel it is all the same to me. Then again I am not a big traveler, so I can't say much. I just look for anything that looks semi-intelligent.